We’d love your help. 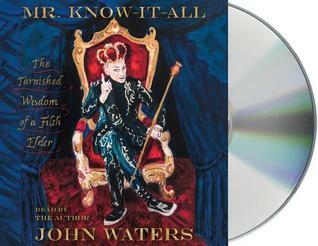 Let us know what’s wrong with this preview of Mr. Know-It-All by John Waters. This program is read by the author and includes a bonus conversation. No one knows more about everything—especially everything rude, clever, and offensively compelling—than John Waters. The man in the pencil-thin mustache, auteur of the transgressive movie classics Pink Flamingos, Polyester, the original Hairspray, Cry-Baby, and A Dirty Shame, is one of the world’s great so This program is read by the author and includes a bonus conversation. 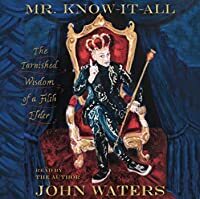 Studded with cameos of Waters’s stars, from Divine and Mink Stole to Johnny Depp, Kathleen Turner, Patricia Hearst, and Tracey Ullman, Mr. Know-It-All is Waters’s most hypnotic, upsetting, revelatory audiobook yet —another instant Waters classic. To ask other readers questions about Mr. Know-It-All, please sign up. There is only one John Waters, and he chooses to present his memoir in the form of a "how-to-be-me" advice column. Life, death and "Chutes and Ladders board game known as show business." He covers it all. It's fair to say he doesn't suffer fools lightly, but is also the best kind of friend to those he holds dear, providing opportunity for what could probably be called outsiders and in whom he recognizes gold. Much as he likes to smash hypocrisy with his outlaw personna, underneath he really is a There is only one John Waters, and he chooses to present his memoir in the form of a "how-to-be-me" advice column. Life, death and "Chutes and Ladders board game known as show business." He covers it all. It's fair to say he doesn't suffer fools lightly, but is also the best kind of friend to those he holds dear, providing opportunity for what could probably be called outsiders and in whom he recognizes gold. Much as he likes to smash hypocrisy with his outlaw personna, underneath he really is a mensch. There were places I laughed out loud (calling 50 Cent "...the Donald Trump-meets-Chick-fil-A of rap"). Ive been a fan or Waters from day one and have read all of his previous books. This one is a departure—more a how to guide to succeed in the modern world without sacrificing your individuality. Buttressed by tales of his movie making and home life, this memoir/how to is fascinating reading for anyone — not just Waters fans. Highly Reccommended. Thanks to NetGalley for the ARC In exchange for an honest review. I am a "First Reads" winner. Shortly after reading 'Mr. Know-It-All,' I watched - again - 'Pink Flamingos' to get a visual reminder of what makes John Waters THE Filth Elder. Both 'Pink Flamingos' and 'Mr. Know-It-All' didn't disappoint …. Waters' writing is perfect and captivating - especially as he remembers what went into the production (and subsequent responses) of his films. I enjoyed his wonderings in "Delayed" (been there, too), "Flashback," and "No Vacation" - my favorites. A great (filthy I am a "First Reads" winner. I received an ARC of this book in exchange for a honest review. I was initially confused by this book. I thought it was going to be an advice book, but that’s not what this book is. I’d consider this a collection of essays on whatever John Waters felt like writing that say. He does provide a behind the scenes look at the making of some of his films and there’s a chapter about music that I adored and would love to have read more. John's best book yet, full of all the content and wit you love him for. Whatever you might have heard, there is absolutely no downside to being famous. None at all. I received a NetGalley copy and, unfortunately, DNF'd this about 15% of the way in. I read John Waters' book Carsick, about his weird and wild hitchhiking journey across America. And, although I'm not really a fan of his work, there's a part of me that can appreciate his counter-culture approach to life and art. This book is a mish-mash of hyper-specific advice based on key moments in his career. They don't feel particularly applicable and didn't hold my interest. After a fairly fun and insane i I received a NetGalley copy and, unfortunately, DNF'd this about 15% of the way in. I read John Waters' book Carsick, about his weird and wild hitchhiking journey across America. And, although I'm not really a fan of his work, there's a part of me that can appreciate his counter-culture approach to life and art. I was not very familiar with John Waters before I read this book. Safe to say, I know quite a bit more now! I enjoyed the back story for his films and Provincetown. I also found the piece on Christmas Trees to be hilarious!. I was a little confused on the inclusion of the Andy Warhol chapter, but, overall, I really enjoyed this memoir! Thanks to #netgalley for the advance copy. John Samuel Waters, Jr. is an American filmmaker, actor, writer, personality, visual artist and art collector, who rose to fame in the early 1970s for his transgressive cult films: Pink Flamingos and Hairspray. He is recognizable by his pencil-thin moustache.